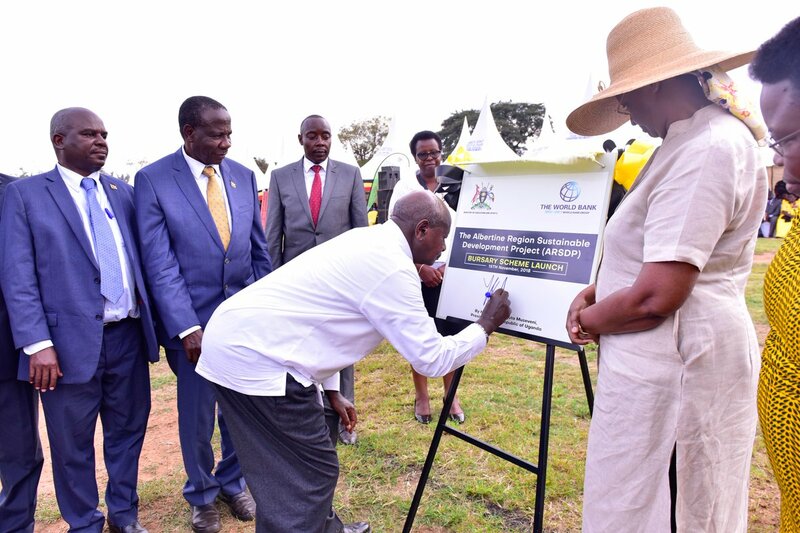 HOIMA – President Museveni has urged the people of Bunyoro Sub-Region in Western Uganda to encourage their children to join the Albertine Bursary Scheme to enable the youth to acquire skills that will help them access employment both locally and internationally. He also called on them not to be misled by those talking only about oil. “People of Bunyoro should encourage their children to join the program. You shouldn’t be misled by people who are singing about oil because oil will get finished,” he said. 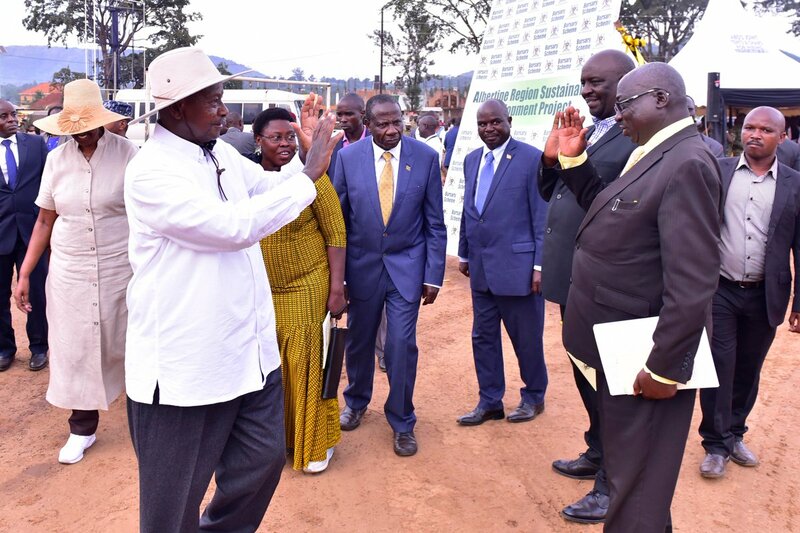 The President made the remarks while launching the Albertine Region Sustainable Development Project (ARSDP) Bursary Scheme at the Boma grounds in Hoima Municipality, Hoima District. Mr Museveni noted that once the youth have acquired the skills, they will remain with that knowledge even after the oil is finished and they will be employable locally, regionally and internationally. “Here, we are talking about three things; skills, certification and accreditation. Children are going to get the universal capability,” he said. The Bursary Scheme that is implemented by the Ministry of Education and Sports is meant to provide free training to 600 learners drawn from the Albertine Region covering the districts of Nebbi, Nwoya, Buliisa, Masindi, Kiryandongo, Hoima, Bunyangabu, Kakumiro, Kagadi, Kyenjojo, Kabarole and Ntoroko. Courses offered under the Bursary Scheme include, for level one, Civil Structural Engineering and related labourers as well as Hospitality and Catering. The level two component will cover all areas of Civil Structural Engineering and Construction, Driving, Mechanical and Electrical trades. Ugandan citizens with a minimum of Ordinary Level School Certificate of Education are eligible to apply by filling in forms obtained from District Education Offices of the districts that have been mentioned not later than 11th January 2019. Applicants must have lived in those districts that have been enumerated for at least 5 years. The Minister of Education and Sports, Hon. Janet Museveni, on her part, urged all leaders at all levels to make sure that the beneficiaries get this golden chance for their bright future. “I call upon all politicians, religious leaders, cultural leaders, parents, learners and the community at large, to take this golden opportunity and ensure that all eligible Ugandans compete to access the bursaries that are on offer and acquire marketable skills that can help improve their employability and livelihoods,” she said. She further appealed to parents, the community and the institutions to give priority to girls within the region to benefit from the bursary scheme. The representative of the World Bank at the function, revealed that her institution is happy to note that priority will be given to girls in the project. She pledged to further support the Ministry of Education and Sports to build human capital. The function was attended by among others the Minister of Finance Hon. Matia Kasaijja, Ministers from the region, MP’s and the Prime Minister of Bunyoro Kitara Kingdom Andrew Byakutaaga. Earlier on arrival, President Museveni inspected an exhibition of skills learned by various institutions that included, among others, Uganda Petroleum Institute Kigumba (UPIK), Buhimba Technical Institute, NVI Bishop Mukasa Centre, Hoima and Hoima School of Nursing and Midwifery.